Since I wrote about the threat to Internet radio a few weeks ago, things have gotten worse for music streamers like Last.fm and Pandora. The Copyright Review Board (CRB), which sets the cost paid to content owners, refused to hear an appeal to a rate increase that stands to shut down a lot of music streams. Net stations have turned their attentions to Congress, which is showing signs of action, but D-Day is July 15. That’s when retroactive hikes, amounting to more that triple the current rates, kick in. It should be noted that these are fees paid ONLY by online radio operators. When that happens, many web sites will have but one option – to shut down. Many prominent webcasters have signed up, though participation from big terrestrial players like Clear Channel is not yet forthcoming. This may change, as Sound Exchange, the music industry agency that successfully won the CRB case, is making noises about trying to raise the “performance rates” paid by terrestrial and satellite operators. I suppose for some readers, this is all a bit esoteric, but then again so were compact discs in 1984. But if the leading edge of technology is destroyed before it has a chance to become mainstream, everybody loses. For example, what if the movie studios had won their lawsuit against Sony’s VCR and made it illegal to record movies from your television? So much stands to be destroyed in the name of protecting an industry that has proven time and again to be its own worst enemy. In a few days, you’ll have a chance to witness where this short-sightedness leads. 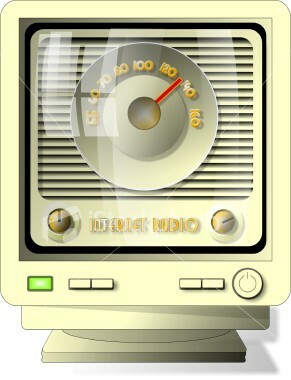 Cell phone networks are becoming fast enough to support Internet radio streams, yet this ruling, if it stands, means few if any will ever get started. Those that do will probably play it safe to reach the lowest common denominator. I’ve already got too many of those in my car. Great music comes from bending rules and breaking barriers. The Internet is the only truly nurturing environment for the few cultural revolutionaries still in our midst. Shutting it down doesn’t make sense. Thursday: Tuck Stocking, Gusanoz – Cinco de Mayo is to this place what St. Patrick’s Day is to Salt Hill, an excuse to celebrate all week long. Tonight, one of the best young guitarists in the area steps up. Tuck provided the secret sauce on Syd’s first record, and his work on the Conniption Fits’ latest helped to turn their new album into a regional hit. Friday: Sol Y Canto, Lebanon Opera House – This Latin-flavored combo will be busy today, performing two educational shows early Friday morning, and playing with the Upper Valley Music Center’s Children and Youth Chorus at 7 PM. Buoyed by Rosi and Brian Amador, the band’s name means “Sun and Song.” With Rosi’s redolent singing and Brian’s expressive Spanish guitar stylings, it’s a sound that’s as hot as good salsa. Saturday: Joey Leone’s Chop Shop, Claremont Opera House – Will the plaster stay on the walls? Can the old opera house stand the shock of the rock? We’ll see when Leone takes the stage. Over the course of his two-hour set, Joey channels everyone from Zeppelin to ZZ Top. Lonnie Youngblood calls him the best guitarist he’s played with since Hendrix, and fans pack the ski resorts whenever he plays. Sunday: Ronnie Milsap, Paramount (Rutland) – He established his bonafides with hits like “There’s No Gettin’ Over Me”and “I Wouldn’t Have Missed It For The World.” I was reminded of how talented Milsap is when Joan Osborne recorded his Grammy-winning hit, “Please Don’t Tell Me How the Story Ends” on her most recent album. This, my friends, is the Nashville Sound. If you love it, Ronnie’s your man. Tuesday: Wailin’ Jennys, Iron Horse – As Pete Townshend said, all the best heroes have Chinese Eyes, and all the best Americana comes from Canada. Rough-hewn and utterly charming, this trio got a nice nudge from regular appearances on “A Prairie Home Companion.” Their music is a mix of Dixie Chicks harmonies, rustic overtones and some seriously sweet picking. Wednesday: Terry Diers, Canoe Club – Like a lot of area musicians, Diers wears a few hats. He plays with the rock bandk Skinxs and does bluegrass with Celtic hammered dulcimer player Samantha Moffatt. Tonight, he plays solo on several instruments – 6 & 12-string guitar, mandolin, and even a little piano. Everyone knows the music, but few know Doc Pomus. Halberstadt’s book brings him vividly to life. This insprirational tale should be required reading for anyone faced with adversity. Stricken with polio at a young age, the highlight of his childhood might have been seeing his picture in the local paper over the caption, “Paralyzed Boy Is Gleeful” – he’d been given a puppy by New York radio station. But Doc Pomus, born Jeremy Felder in 1925, overcame that and many other challenges over the course of his his life. He walked on crutches with his legs in steel braces, and dreamt of being the world’s greatest handicapped boxer, and played the saxophone, but that ended when his knuckles were shattered by a hooligan’s iceball. By age 14, he’d changed his name to and was singing blues in New York nightclubs, leading a double life he kept well-hidden from his mother and father. During the late 1940s and early 1950s, a time marked by a sea change from jazz’s dominance to the birth of rock n’ roll, Pomus was one of the few white regulars to play the Harlem’s grittiest blues spots, but mostly struggled to achieve the success of his counterparts. Pomus did a few sessions, and scored an unlikely “hit” with a clothing store jingle, but that was about it. On one of many trips to then-young Atlantic Records trying to score a session, Pomus’s childhood hero Big Joe Turner suggested he write him some songs. 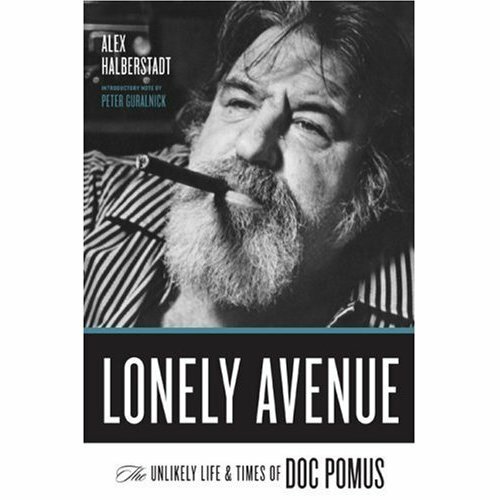 Doc accepted the offer and wrote three songs, including “Lonely Avenue.” Atlantic producer Jerry Wexler gave it to Ray Charles, who heard the soulful hunger in the song and “got it right away.” Thus began Doc Pomus’s career as a writer.. The story of how “Save the Last Dance For Me” came to be is one of the book’s highlights. After a long an sometimes awkward courtship, he married the aspiring actress Wilma “Willi” Burke in 1957. Three years later, he wrote the first draft of the song on the back of a wedding invitation, remembering how he watched his brother and other guests dance with his new bride at their reception. There were plenty more ups and downs in Doc Pomus’s life. The highs included working in the Brill Building beside great tunesmiths like Carole King and Gerry Goffin and writing chart hits for the Drifters and other doo-wop bands. He enjoyed a long collaboration with Mort Shuman that ended at nearly the same moment as his marriage to Willi, financial ruin and spiritual rebirth through his marriage to Shirlee Hauser. The animated denizens of midtown Manhattan circa 1960 are brought wonderfully to life, including a young Rodney Dangerfield and Muhammad Ali, punctuated by all-night card games and, of course, lots of great music. He might as well have been repeating his own advice to himself. Doc Pomus never gave up, and was writing great music throughout his life. He collaborated with Willy DeVille in 1980 on a project that produced “Just to Walk That Little Girl Home” and “There Must Be A Better World Somewhere.” Right before he died in 1991, he did some of his best work with Mac Rebennack, a/k/a Dr. John. Halberstadt uses source material from friends, family and colleagues; he also had access to Doc’s voluminous diaries. “Lonely Avenue” is a richly detailed, and long overdue, study of an overlooked musical treasure. It firmly establishes Doc Pomus’s place as one of the most important figures in American music.